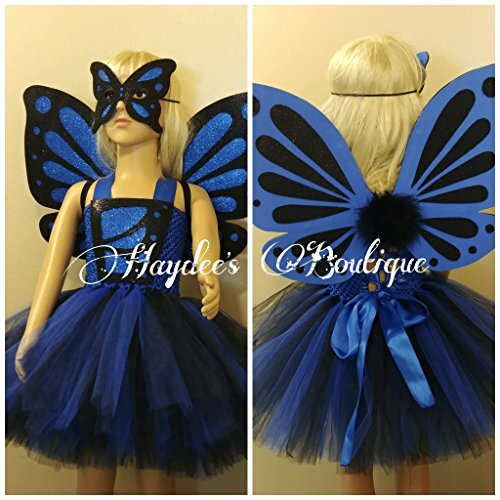 This is a 3-piece dress set that includes the tutu dress, wings and mask. Tutu dress has a fully lined blue crochet top with 1.5" blue satin straps that feature a corset tie on the back. Blouse has a black and blue glitter fun foam chest piece in a beautiful graphic butterfly pattern. Dress has a short length, 3-layer tulle skirt in blue and black. The wings are made of blue and black glitter fun foam with wire center for support, black boa and elastic straps. Wings measure approximately 20" wide by 11" in height. Mask is made of blue and black glitter fun foam in matching pattern to chest piece with an elastic tie. ** Larger sizes are available, please contact us directly for pricing. Please be sure to read our policies prior to your purchase. A size chart is included within the pictures in the listing to help you with sizing. Haydee's Boutique is not responsible for lost or stolen packages. Please be sure to provide a shipping address in which the package will be received safely. Due to the potential choking hazard of rhinestones, buttons and other small parts, products may be modified/altered for children under 3 years of age. We ask parents, and big brothers and sisters to exercise caution when playing with tutu costumes. Tutus may contain materials that can be torn or broken and be a potential choking hazard. If you have any questions, or concerns, please contact us directly.